What do you get when you take the crispiest pretzel rods ever, dip them in luscious premium caramel then top them with sinfully-good chocolate toppings? An unbelievable savory-sweet delight that will thrill any chocolate lover! 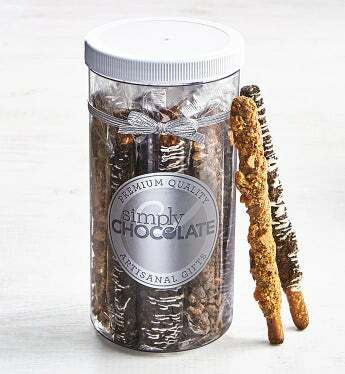 These indulgent treats are dipped in creamy caramel and then decorated them by hand to decadent perfection with a variety of scrumptious toppings including dark chocolate chips, chocolate candies, chocolate sprinkles, OREO cookie pieces, and toffee crunch. What do you get when you take the crispiest pretzel rods ever, dip them in luscious premium caramel then top them with sinfully-good chocolate toppings? An unbelievable savory-sweet delight that will thrill any chocolate lover! These indulgent treats are dipped in creamy caramel and then decorated them by hand to decadent perfection with a variety of scrumptious chocolate toppings.